Influencer endorsement is not a new concept, it has however taken on a completely new meaning since the emergence of social media. A celebrity’s influence has become larger and far more valuable with the ability to personalise their endorsement of a brand. Through ‘organically’ integrating products into a social media post, followers become more susceptible to influence, and are more inclined to listen when it is in a celebrity’s own words. Currently the most liked image on Instagram is a Coca Cola sponsored post from Selena Gomez, with 6.2 million likes and counting. When an influencer seems to genuinely like and use a product on social media it is arguably far more effective to a consumer than traditional advertising, even when that celebrity is featured. What Selena Gomez proves is that when ads are incorporated well, fans respond positively to the brand. It is this fact that brands have come to recognise and is why paid social media posts are fast becoming celebrities most lucrative asset. Sponsored content however, is not just for celebrities. Any ordinary social media user with enough followers can utilise their influence to make money from sponsored content. 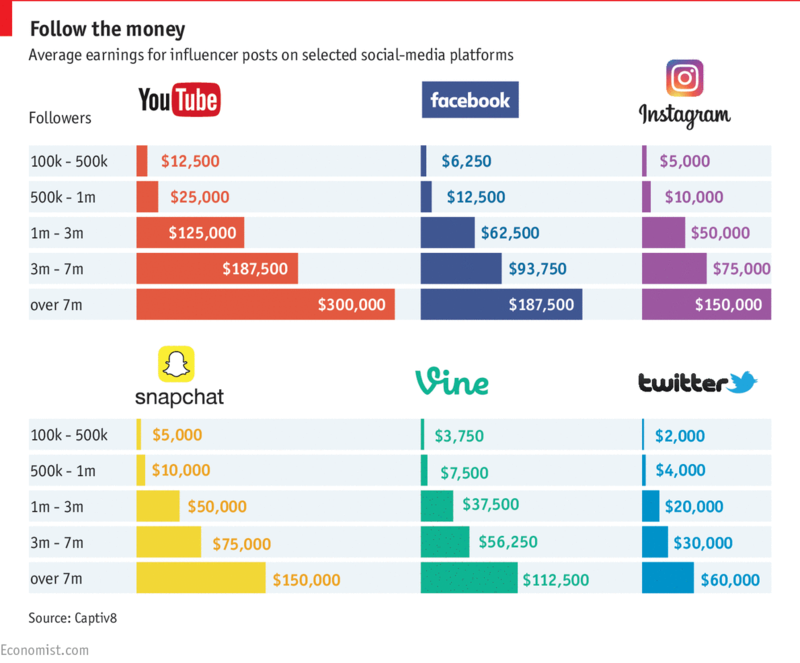 Users with as few as 100K followers can make significant money from sponsored content, proving fame is not everything when developing a successful social media brand. Many have found the secret to success is finding your niche and remaining consistent. Repetition is key to successful accounts. Followers respond when they know what to expect from an account and when you stray away from your niche, you lose followers. Therefore, smaller accounts remain successful for brands to advertise through, as they value follower engagement over sheer number of followers. An account with 100 followers where all followers engage with posts can be worth more to an advertiser than one with 1000 followers where no-one engages. You can’t make an impact with people who aren’t paying attention. Brands that recognise influential individuals and utilise their reach and personality well will see the results.